While primarily known as a scholar of medieval and modern art, Meyer Schapiro was also interested in artists and art movements outside of these two genres. 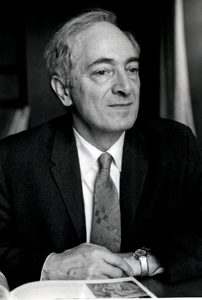 In this regard, Meyer Schapiro wrote about "naive painting" in the unpublished outline titled "Significance of modern naive painting" and his writing on this genre is as topical as it is intriguing. The term "naive" art has etymological roots with "outsider" and "self-taught" art, and, indeed, these terms have been conflated with each other. 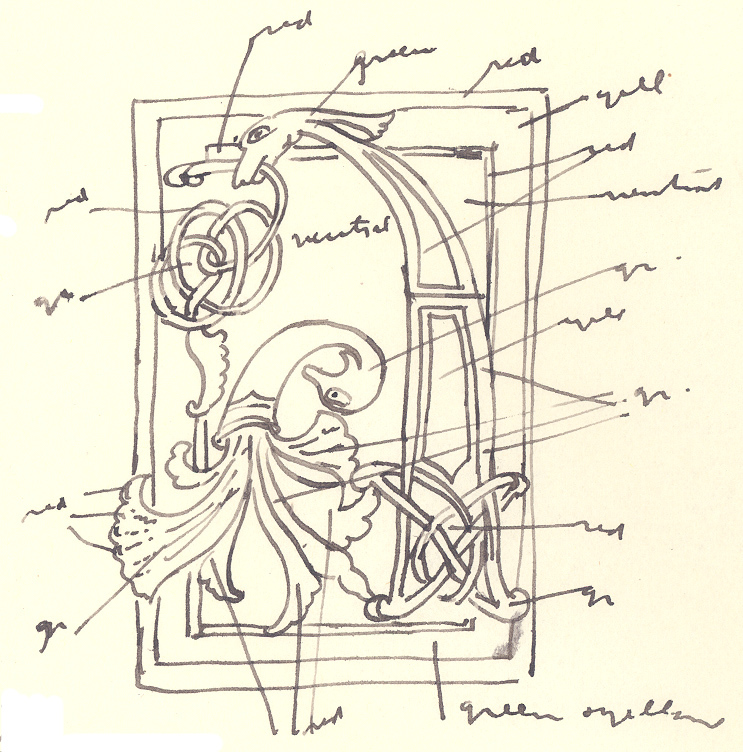 While each term has its set of socio-cultural issues (whether they be art historical, museological, sociological, economical, or racial), naive, outsider, and self-taught art have deep roots in the art historical canon, even while the genre itself spirals in and out of the canonical orbit constructed from an Anglo-European art historical framework. The conflation of these terms stems from their mutual affinity in describing artists who were not formally trained, but relied on their own social, cultural, psychological, and ethnic resources to execute their art practices. That Schapiro was writing on naive art in the 1940s and 1950s is quite a revelation. For it was in those years when this genre of art was waning in popularity due to the rise of another nascent and emerging genre, Abstract Expressionism. The history of self-taught art in the United States is rife with compellingly contradictory trajectories. Self-taught art can be art historically traced to artisanal folk traditions in the United States (primarily from New England), to European art historical scholarship on art and psychiatry (from the likes of Hans Prinzhorn whom Schapiro was in correspondence with in the 1930s), and, finally, to self taught "primitive" artists as articulated by the author Sidney Janis in the publication They Taught Themselves: American Primitive Painters of the 20th Century. 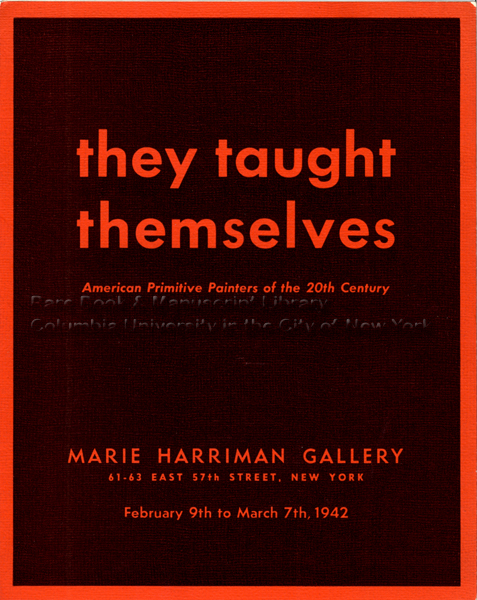 Janis’s publication also had an accompanying exhibition of the same name that was mounted at the Marie Harriman Gallery in Manhattan from February9 through March 7, 1942. Schapiro may have attended this exhibition, as his archive includes a copy of the Harriman Gallery brochure which is pictured above at right. The history of "naive art" highlights a portrait of American identity between the World Wars: one that eschewed the tastes of the upper class for a populist (and popular) narrative that was thought to resound with the public, especially in times of economic distress due to the Depression and to social unrest because of World War I and world tensions leading to World War II. As Abstract Expressionism became the leading cultural identity for a victorious America after World War II, the self-taught genre became marginalized. It wasn’t until the 1960s onward that the genre became to be appreciated again by the likes of collector Herbert Hemphill for its strong aesthetic and cultural significance. Modern naive, home-made painting presupposes the general change in painting to an art of personal experience and perceptions. The domestic painter discovers this not through contact with artists, but through the pictures themselves; the fact that he sees so many landscapes and intimate scenes and beautiful girls permits him to identify painting with his own desires and images. The relation between painting and fantasy of perception is more direct than in literature, where the command of language requires a long cultivation and symbolic method, the painter who represents a beautiful landscape or woman recreates the stimulus or the object of desire, its dreamed of colors and shapes. While Schapiro’s writing on naive art went unpublished, it is uncanny in that it reveals how scholars and gatekeepers would reconceptualize the genre thirty years later. Schapiro positions these artists, whom he terms "domestic painters" as visionaries. Modern naive, home-made painting presupposes the general change in painting to an art of personal experience and perceptions. The domestic painter discovers this not thru contact with artists, but thru the pictures themselves; the fact that he sees so many landscapes and intimate scenes and beautiful girls permits him to identify painting with his own desires and images. The relation between painting and fantasy or perception is more direct than literature, where the command of language requires a long cultivation and symbolic method; the paitner who represents a beautiful landscape or woman recreates the stimulus or the object of desire, its dreamed of colors and shapes. In this regard, for Schapiro, "naive painting" is "image painting" and "not abstraction or automatism or collage or expressionist formalism. " Schapiro also touches on another controversial topic for scholars of the genre: its position and relation to modern and contemporary art. Why are there no important naive artists before Rousseau? Have they been lost because of lack of interest in their work? Are the American domestic painters of the 18th and 19th centuries comparable to the modern naive artists? One must be cautious in answering these questions, since the material has never been collected properly; and what has been exhibited is judged mainly from the viewpoint of modern art. That the works by naive artists are to be viewed from outside the viewpoint of modern art, or seen under a different lens altogether as Schapiro highlights, is one that underlines these works as created outside the modernist canon. In retrospect, however, and as the etymology of the terms "naive," "primitive," "self-taught," and "outsider" art have demonstrated, these genres have a lineage that was part of the "modernist" canon itself in that, as definitions, they were constructed to clarify each other as descriptive terms to understand the practices of artists during a given historical time. By bringing into relief the process of looking at these works, one can sense Schapiro’s keen call to perceive and look closely, differently, and with pleasurable scrutiny at this genre, all ideas that he sought to bring to the art historical discipline. Is there any other period in which painters are self-taught? Perhaps in the middle ages, in the monasteries or scriptoria, which produced much home-made painting and ornament and perhaps stone-work. Then, as today, painting was cultivated as a private or personal evocation, as a marginal activity. A compelling idea from a consummate medievalist. This entry was posted in art history, Naive Art, New York City art galleries, Outsider Art, Self-taught Art, Uncategorized on October 20, 2009 by Administrator. Archivists are very familiar with the transfer of archival material: from filing cabinet to box; box to truck; truck to repository; repository to archivist; archivist to process; process to description; and, finally, description to access. Electronic records follow the same general transfer, but, instead of a physical “filing cabinet,” there is the “file structure” of electronic files on a desktop, server, or hard drive whose final user access is most likely mitigated via a digital repository. This project has certainly had its share of transferring archival material. 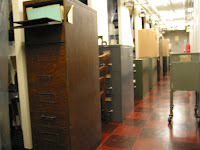 Initially, the manuscript portion of the collection was housed in their original filing cabinets as seen to your right. (Those boxes stacked above the cabinets are Meyer Schapiro’s art works which have been described to the individual item and rehoused). 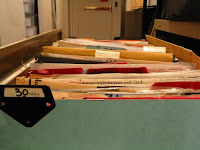 As seen on your left, each individual file drawer included material that encompassed a broad range of Schapiro’s professional life, such as course outlines, lecture notes, research files, and correspondence. All these files were transferred to record carton boxes to facilitate the processing of the material and to aid in the process of creating a records arrangement that would intellectually describe the contents of the archival material. 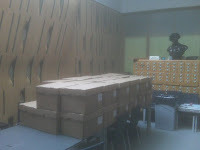 This image to the right shows boxed material of exhibition announcements that were transferred from the Visual Resources Center housed at Columbia University’s Art History and Archeology department. These exhibition announcements span from the 1920s to the 2000s and were collected by Schapiro and his wife Lillian Miligram Schapiro. They were systematically filed and organized chronologically by artist’s last name. This portion of the archive, or “series” in archival parlance, is a phenomenal example of how collected ephemeral material can gain historical resonance. All these exhibition announcements and invitations give a micro-history of New York City through the lens of the art gallery. It shows who owned galleries, where their spaces were located, which artists were exhibited across time, and what art works were shown. Many research avenues can come through this: provenance research on individual works of art; a history of the art establishment in New York City; and the rise of certain artists and art genres. Ultimately, and most importantly, they give a sense of what Meyer Schapiro might have seen and give a sense of how active he was as an art historian. In the future, I’ll share a few exhibition announcements on this blog. Keep posted. This entry was posted in archival processing, art history, ephemeral collections, exhibition announcements, New York City art galleries on September 15, 2009 by Administrator.